Main ImageCopyright: © The Andy Warhol Foundation for the Visual Arts, Inc.
(Recto) lower right, blindstamp: "© ANDY WARHOL"
In Andy Warhol's depiction of his old friend Robert Rauschenberg as the wounded artist, the gauze and bandages add layers to the portrait in a way similar to Rauschenberg's own layered working methods. He and Warhol met in 1960 and two years later got together at Warhol's studio in a session that provided inspiration for both artists. 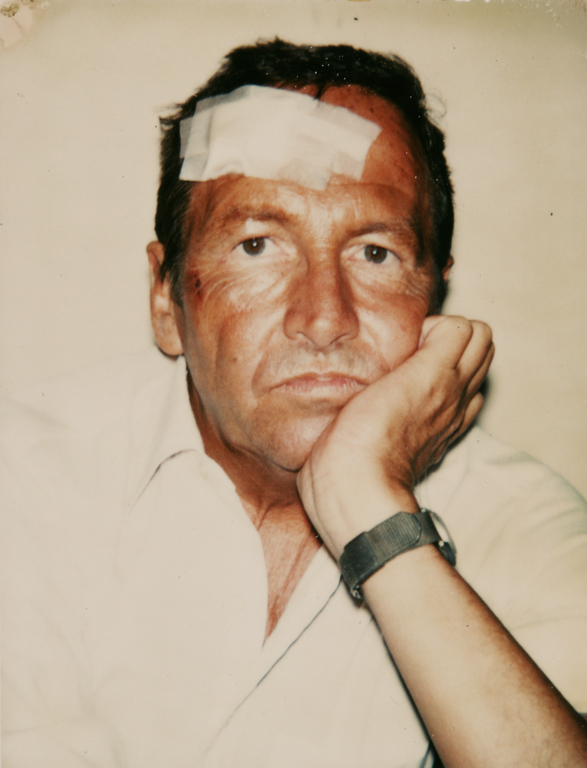 Rauschenberg discovered the silkscreen process that Warhol was already using to transfer photographic images to canvas, and Warhol decided to do a series of paintings based on family snapshots of Rauschenberg, taking him as his first non-celebrity Pop subject. Through large canvases that repeated his portrait as many as twenty-five times, Warhol made Rauschenberg's face famous. A passion for photographs, including those they made themselves, was at the center of artmaking for both Warhol and Rauschenberg. Rauschenberg's confidence in photographs as major gallery pieces may have reassured Warhol that he should begin exhibiting some of the hundreds of photographs he had made in documenting his own life. Baldwin, Gordon, and Judith Keller. Nadar Warhol: Paris New York: Photography and Fame. Introduction by Richard Brilliant. (Los Angeles: J. Paul Getty Museum, 1999), p. 172.